One thing that has always been important to us at Zadok Jewelers is the idea of creativity and self expression. We realize that although we carry a large selection of designer jewelry, which represents and caters to a variety of customers, it is very important to us to allow our customers the opportunity to design and create the exact piece of jewelry that fits both their unique taste and style. Whether it is the perfect piece of wearable art that symbolizes and expresses their love for someone else or even creating something for themselves that reflects their own individual character and personality, there is always something for you. From personalized custom made engagement rings to necklaces, pendants, bracelets and many others… the possibilities for self expression and creativity are endless at Zadok Jewelers. If you have always wanted to design your own personal piece of jewelry, or redesign a piece of jewelry you already own including family heirlooms, Zadok Jewelers is at your service. We have an on-premises jewelry workshop for all of your custom jewelry needs using the latest and most advanced technology in the jewelry industry to ensure the highest degree of quality and customer satisfaction. Our sales associates and designers will be pleased to help you design a unique piece of jewelry. We welcome customers to consult with one of our experienced jewelry designers. Don’t be afraid to be yourself at Zadok Jewelers. Few things in this world are more unique than something that is realized through the creative drive and passion of an individual. As no two people are truly the same, the physical expression of each person’s inner spirit is just as unique. Do not be afraid to be yourself. Our on-premise jewelers and staff have many years of experience and extensive training along with a passion and knowledge for fine jewelry and gemstones. With seven generations of jewelry craftsmanship as the Zadok family legacy, we will guide you from vision to fruition with your own unique custom designed jewelry pieces. From understated to opulent, stunning to serene, the possibilities are endless with Zadok Jewelers custom design. 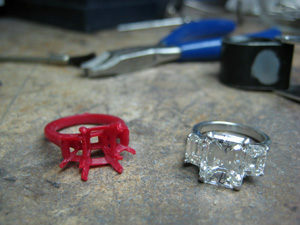 Below are some sample videos from Zadok.TV showing the jewelry design and creative process. These are just a sampling of the videos we will be coming out with showing you a more detailed, behind the scenes look at the making of some of the amazing custom pieces that we have become known for during our more than 34 years in business.